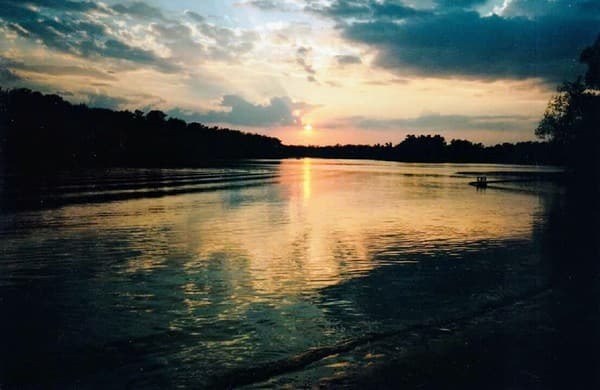 Guest house "Family & Friends" is located in Kiev, on the left bank of the Dnieper River, a 5-minute walk from the tranquil beach. 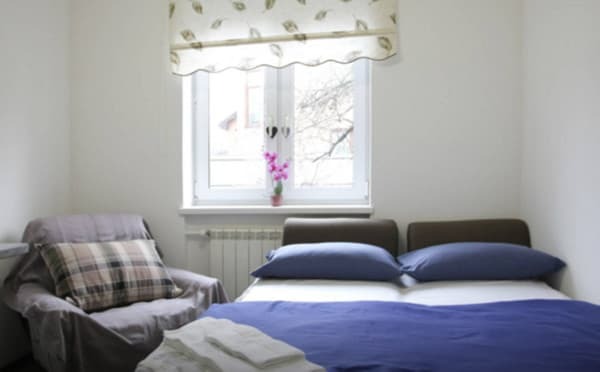 Guests are offered accommodation in three separate rooms, which are located on the ground floor with an individual entrance, a common dining room with a fully equipped kitchen, and a bathrooms with free toiletries. The rooms can be combined into one large room with a capacity till 10 people. Guests have free parking for two cars in the courtyard. As the windows face south, the residents can enjoy a beautiful view of the garden. Free Wi-Fi, slippers and a built-in safe are also available. 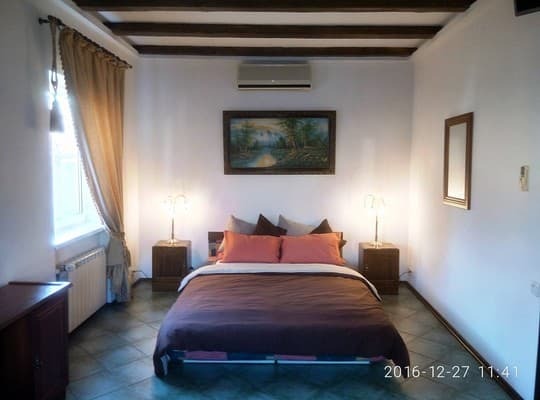 Description of the room: Located on the first floor of the guest house. The modern style is emphasized by new functional furniture and fittings. The room is for a maximum of 2 people. The complete set includes: a double bed and a wardrobe in which you can compactly place your things. From equipment: 22-inch LCD TV with built-in DVD and set of television channels, which are provided for free, iron, hairdryer, telephone. A shared bathroom for 2 rooms on the ground floor. The kitchen is shared by all rooms of the guest house and is located on the first floor. 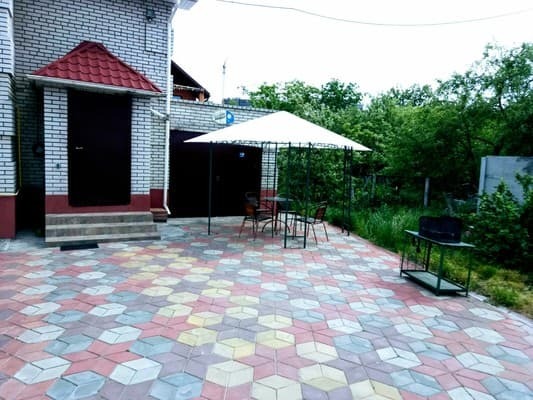 It will accommodate a company of 6 people, as it is equipped with 6 chairs and a large dining table, as well as everything necessary for cooking: a refrigerator, a gas stove, a microwave, an electric kettle, a set of dishes and cutlery. 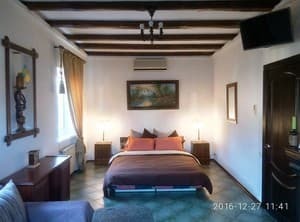 The price includes: free use of Wi-Fi Internet access, towels, bed linen, slippers, soap and shampoo. Guests may request irons / ironing boards and washers / dryers. Описание номера: Located on the first floor of the guest house. The design of the room is made in warm colors, as well as endowed with natural light, which, filling the room, gives it home comfort. 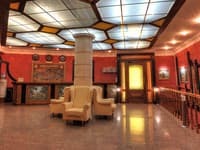 The modern style is emphasized by the real fireplace, new functional furniture and accessories. Room designed for a maximum of 4 people (2 + 2). The package includes: a double bed, a sofa bed, and a wardrobe in which you can compactly place your belongings. From equipment: 28 inch Smart LED TV, with built-in set of TV channels that are provided free of charge, iron, hairdryer. 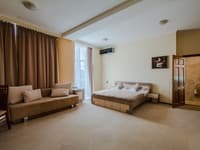 A bathroom with free toiletries and a dining room with a fully equipped kitchen are shared between the two rooms of the guest house and are located on the first floor. A large company can be freely accommodated in the dining room, as it is equipped with 6 chairs and a large dining table, as well as everything necessary for cooking: a refrigerator, a gas stove, a microwave oven, an electric kettle, a set of dishes and cutlery. Было очень удобно и уютно. Check in time is 14:00. Check out time is 12.00. When one child under 6 years old using existing beds, it is provided free of charge. Upon check-in, photo identification is required. Please note that special requests cannot be guaranteed and additional charges may apply. Breakfast is not included in the room rate, it can be ordered separately. Please observe the peace and order in the guest house. Mass events are prohibited. Visiting guests only after agreeing with the administrator. Please inform Family and Friends in advance about your possible arrival time. You can use the Special Requests box when booking, or contact the property directly - contact details are provided in your booking confirmation. There are several restaurants and shops nearby. 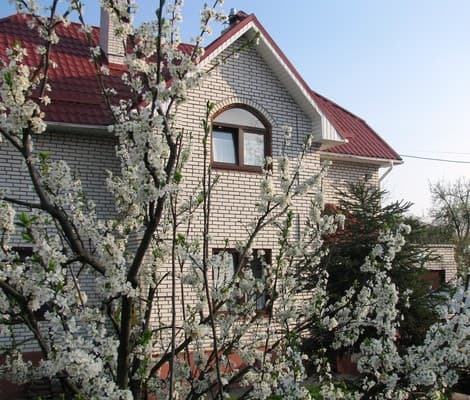 Guest house "Family & Friends" is located just 1 km from the International Exhibition Center and 20 minutes from Boryspil International Airport, and within 14 minutes you can walk to Victory Park or Komod entertainment center. In addition, from the bus stop located near the guest house a bus leaves every 15 minutes to the metro station Levoberezhnaya (5 minutes). Near the house there is a temple of the Protection of the Holy Virgin of the Female Monastery and a picturesque Hydropark. In 500 meters there is the Consultative-Diagnostic Center of the Dniprovsky district and the Center for Primary Health and Sanitary Care. From Boryspil International Airport: airport transfer is available. Timetable of the transfer from / to the airport: by arrangement. The duration of the trip to the accommodation facility (Guest house Family & Friends) is 30 minutes. - use for an additional fee of 280 UAH. (The trip can take longer during rush hours.) Airport shuttle service is available from Zhulyany Airport. Timetable of the transfer from / to the airport: by arrangement. The duration of the trip to the accommodation facility (Family & Friends Guesthouse) is 20 minutes. - use for an additional fee of 200 UAH. (The trip can take longer during rush hours.) From the metro Levoberezhnaya: The bus line is 215k. The duration of the trip is 5 minutes, the cost is 4 UAH. 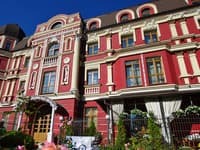 On foot - walk from the metro Levoberezhnaya to the accommodation facility takes 15 minutes. By car: the nearest junction on Lunacharskogo street on the motorway H07. Duration of the trip by car in off-peak hours - 5 min.